GENEVA, Switzerland, March 5, 2014 (ENS) – The Peugeot 308 sedan was named Car of the Year 2014 Monday at the Palexpo on the eve of the Geneva International Motor Show. The French automaker’s winning entry received 307 points from the 58 jury members, with top points from 22 of the jurors after intensive test drives. Second and third, in a close race, were the two electric cars in the final seven contestants – the German BMW i3 with 223 points and the American entry Tesla Model S with 216 points. The group of finalists included: the Citroën C4 Picasso with 182 points, the Mazda3 with 180, the Skoda Octavia with 172 points and the Mercedes S-class with 170. Hakan Matson, president of the jury panel of international automobile experts, handed the coveted award to Peugeot CEO Maxime Picat. “In addition, the Peugeot sets new standards in terms of interior space – the 308 is light-flooded, comfortable and ergonomic,” he said. The win is a big boost for Peugeot, which was rescued financially last month when the struggling company handed over partial control to the French government and to China’s state-owned automaker Dongfeng. Offered in five-door hatchback and estate body styles, the 308 is the spearhead in the product offensive for Peugeot, Europe’s second-largest manufacturer after Volkswagen. The 308 will come with a choice of four different engines. The use of lightweight and composite materials in the 308 saves an estimated 140 kilograms (308.6 pounds) – a feature that improves performance and fuel economy. Seven publications from different European countries sponsor and organize the Car of the Year award: France (L’Automobile), Italy (Auto), Spain (Autopista), Great Britain (Autocar), The Netherlands (Autovisie), Germany (stern) and Sweden (Vi Bilägare). The Car of the Year award is the first announcement and also the starting signal for the 84th Geneva International Motor Show, which opens to the public on March 6 and runs through March 16. Peugeot has an even greener model on the drawing board – the first air-powered hybrid car – combining gasoline with compressed air. It is designed to run on gas or air, or a combination of the two, and it could be on the market as early as next year. The company said in a statement last week that the Hybrid Air car could reduce gas bills by 80 percent on urban roads. 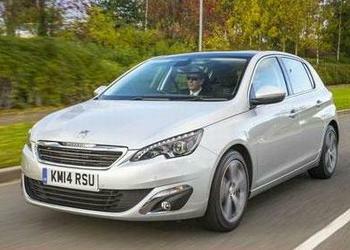 “Air power would be used solely for city driving, automatically activated below 43 mph,” said Peugeot. By 2020, the Hybrid Air could achieve an average of 117 miles to the gallon. Expensive batteries would no longer be needed and Hybrid Air cars would be not cost as much as current hybrid models. Peugeot explained that drivers would never run out of compressed air because the car would replenish itself automatically with sophisticated technology.